Judging the Buick Verano can be a potentially tricky proposition. Because of its tidy size, the temptation to gauge the newest small Buick against a performance yardstick is strong. And, quite frankly, the idea of a high performance Buick is not without precedent. However, given the marque’s more dominant longstanding penchant for quietness and luxury, one would be remiss in strictly evaluating the Verano solely in terms of speed and handling. Because frankly, that really isn’t what this particular new Buick is all about. Think quiet, comfortable and nicely equipped, in a size that should make it easy to live with in the city. Then stir in a generous helping of handsome, along with a big dose of competence on the road, and you’ll be much closer to this Buick’s mission in life. For model year 2013, the Verano is offered in four states of trim; Base, Convenience, Leather, and Verano Turbo (covered in a separate review). 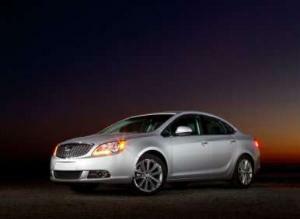 An entry-level luxury car, for $23,975 the Base Buick Verano offers cruise control, remote engine start, 18-inch alloy wheels, foglights, and dual-zone automatic climate control. To bump up cargo capacity, you’ll find split-folding rear seats, and to accommodate a broad range of drivers, a tilt-and-telescoping steering wheel is also fitted. 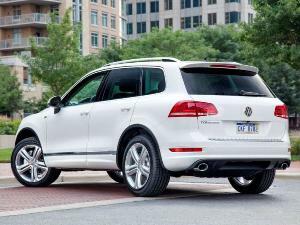 A wealth of tech is on offer too, largely controlled via the seven-inch touchscreen display in the center stack. Among the highlights are Bluetooth telephony and audio streaming. The latter is accomplished through a six-speaker sound system with a CD player, satellite radio, USB/iPod interfaces, an auxiliary audio input jack, and Buick's IntelliLink smartphone compatible connection system. If it’s sounding like this little Buick comes really well equipped, it’s because it does. And, it gets even better. 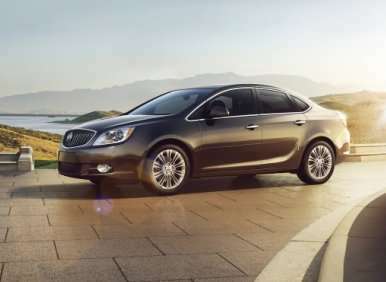 The $25,270 Buick Verano Convenience trim package delivers all of the above plus; a blind-spot warning system, rear parking sensors, a set of heated exterior side mirrors, an auto-dimming interior rearview mirror, and a six-way power articulated driver’s seat with a manual recline function. Stepping it up one more notch to the $27,650 Buick Verano Leather package adds a heated steering wheel, heated front seats, leather upholstery, plus keyless entry and start — along with a nine-speaker Bose audio system. If fully loaded is your preferred way to roll, then you’ll want to be looking at the $30,000 Verano Turbo package. That one nets all of the above for you — in addition to the turbocharged 2.0-liter engine and a rear spoiler. A sunroof can be had as an option with all trims and navigation can be added to all of them as well — except the base model. The look of contemporary Buick models was introduced with the Enclave back in 2007. The lines have since been translated just a bit with the introduction of the LaCrosse and the Regal. For the Verano, this translates into a “fast” (steeply slanted) windshield and rear pillars to give the car a sleek greenhouse, enhancing its profile. 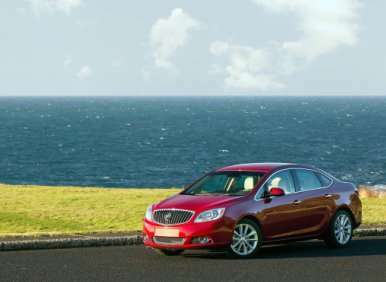 It’s a Buick, so quite naturally there will chrome accents to brighten the car up, this includes the now traditional waterfall grille and portholes on the hood of the Verano. 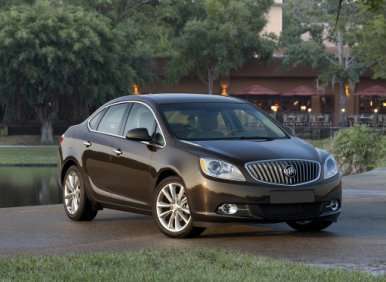 To enhance the sporty look of the smallest Buick sedan, the grille is rendered in black chrome. 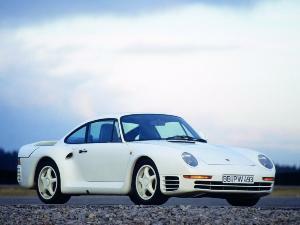 Overall, the styling of the car says it is solid, premium, and modern. The Verano looks fresh, international and sophisticated. All in all, it’s a pretty handsome machine. Spend any time around Buick reps, and the predominating line of conversation will inevitably revolve around quiet. So much so, one would be tempted to believe this is Buick’s raison d’être. 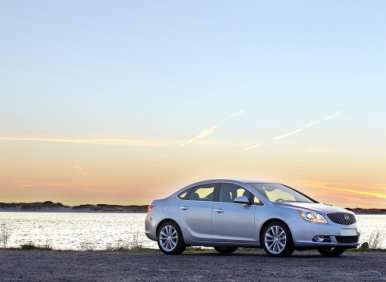 And while it is certainly not the only reason Buick exists, extraordinary pains have been taken to ensure the 2013 Verano fills the quiet bill. Absorptive mats are fitted behind the dash to arrest the intrusion of noise from the engine compartment. The headliner is comprised of five layers, and the floor’s carpeting is of varying thickness to selectively dampen sound. The body structure of the car is both glued and welded, high-strength steel is employed freely, and the exhaust system is tuned to push noise away from the car—while still permitting the engine to breathe freely. This contributes tremendously to the long distance comfort of the car. Noise is one of the factors capable of instigating driver fatigue. As much as we love the sound of a well-tuned high performance car, an aggressive exhaust note does begin to wear on you over time. Of course, too much quiet can be boring, so the Verano’s blend of just the right exhaust note with Buick’s “Quiet Tuning” really makes a difference. The compact exterior dimensions of the Verano might lead you to believe the interior is cramped and uncomfortable; in fact it’s quite the opposite. Well-designed and intelligently thought through, the Buick’s cabin offers a spacious environment for practically everyone. Yes, the rear seat is a bit tight compared to other mid-size luxury cars, but it will carry four adults fairly comfortably. Another very strong positive attribute of the interior is the fact it is very well put together. Fit, finish, and materials choices are all highly commendable. Configured such that every surface some part of your body comes into contact with is either soft-touch or nicely padded, the interior reflects the attention to detail one expects from a luxury model. The trunk offers a very generous 15.2 feet of cargo space, and as we mentioned before, the rear seats split fold to increase the cargo capability of the Verano even more. When it comes to convenience, the Verano’s feature-set is wholly competitive. Bluetooth phone and audio streaming are standard, as are an auxiliary input for an iPod, satellite radio, dual zone climate control, and keyless ignition. Leather upholstery is of course available, but the entry-level leatherette-with-cloth-inserts seat coverings are quite handsome as well. 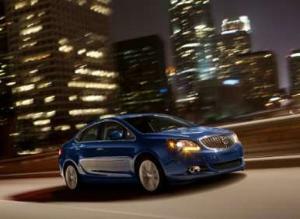 On the tech front, the 2013 Buick Verano is straight state of the art. Its Internet enabled apps include Pandora and Stitcher. 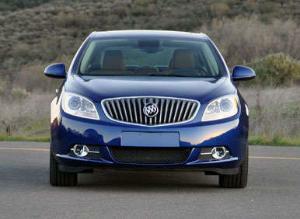 Both are integrated via Buick’s IntelliLink system, which responds to voice commands. Buick IntelliLink can use either Bluetooth or the Verano’s USB port to interact with your smartphone. The system can be controlled through your choice of voice activation and/or steering wheel-mounted controls. Functions are monitored with the Verano’s seven-inch, high-resolution, full-color touch screen display radio. The touchscreen even permits you to arrange the icons for the different apps on the screen according to your personal preference. Of course, all of this tech with an ungainly interface can lead to a great deal of frustration. While the touchscreen can be a bit on the slow side to respond, all of the other controls are nicely arrayed and quite responsive. You do have to learn the dash though — all of the buttons look pretty much alike. That said, most of the switches and controls are exactly where you expect them to be based on their functions. Verano was named a top safety pick by the IIHS and NHTSA awarded the Verano five stars in both front impact and side impacts. Its suite of safety kit includes ten standard air bags consisting of frontal; head curtain, front and outboard rear-seat side-impact, and knee air bags. Meanwhile, the front seatbelts are equipped with pretensioners and load-limiting retractors. The Verano’s collapsible pedal system detaches the pedals during a crash to reduce the risk of leg or ankle injuries. Serving to avoid crashes in the first place are four-wheel anti-lock disc brakes with Panic Brake Assist in addition to Verano’s StabiliTrak electronic stability control system. StabiliTrak is capable of autonomously applying throttle, braking, or a combination of the two to optimize traction and prevent skids. 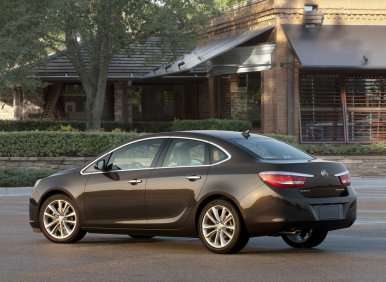 Should a crash prove unavoidable, the Buick is also equipped with OnStar’s Automatic Crash Response. If an airbag is deployed, the Verano will summon assistance for you. On the upper-trimmed models — Convenience, Leather and Premium — Side Blind Zone Alert and Rear Cross-Traffic Alert are standard equipment. 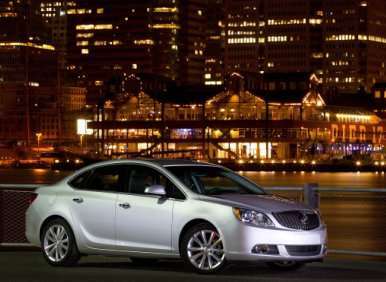 To stave off the possibility of unintended acceleration, the Buick Verano is fitted with an enhanced smart pedal brake override feature to reduce engine power when the brake and accelerator are depressed at the same time. Speaking of the engine, it’s a 180-horsepower, direct-injected, 2.4-liter inline four-cylinder powerplant, capable of generating 171 ft-lbs of torque. 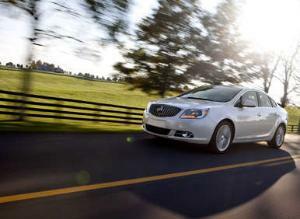 With it, the 2013 Buick Verano is capable of delivering satisfying acceleration off the line—if not exactly quick. The Buick’s six-speed automatic transmission is geared to help this, while also enabling the front-driver to return 21 mpg in the city and 32 on the highway on regular unleaded fuel. Given the Verano’s 3400-pound curb weight, that’s respectable, if not exactly outstanding these days. Underway, the engine is (you guessed it) quiet, developing thrash only at significantly elevated revs and under strong acceleration. The six-speed transmission shifts crisply, downshifts readily if asked to do so, and matches revs on downshifts when employed manually. Steering feel is good, with a decidedly “European” feel. In other words, it’s quite accurate, loads up nicely when cornering forces build, and inspires a great deal of assurance in the Verano’s capabilities. The brake pedal could be a bit firmer, but the Buick stops confidently. Long story short, the Verano feels substantial going down the road. In a very pleasant way, the Buick feels larger than it actually is. Which is not to say it handles poorly. While you won’t get the same visceral response you’d get from say a Lexus IS, you do feel firmly in control of the car. Body roll is minimal, adhesion is strong and the car just feels, well, if you had to describe it in one word — competent — going down the road. Remarkably it does so while also delivering a smooth and comfortable ride. Verano rides like it is much larger than it is, while handling like you’d expect a car of its size, which has been geared toward comfort, should. Further, the quietness of the interior evokes a sense of luxury, while all of the luxurious appointments contained within the car reinforce this sensibility handily. In short, everything about the way the Verano goes says quality. 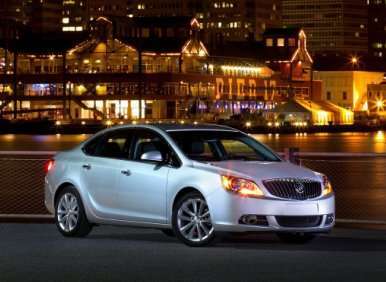 In the 2013 Buick Verano, what we have is a thoroughly modern, quiet, comfortable, content-rich, youthful (surprisingly for a Buick), and well-built compact sedan. The crisply styled Verano is both good-looking and easily capable of satisfying the 95 percent of the car-buying public valuing those attributes over outright performance. Of course, if you’re one of those who absolutely HAS to have it all, the Buick Verano Turbo offers everything the standard Verano models offer, and it delivers significantly better performance too. However, for most people, the standard Verano’s combination of upscale luxury features and city-friendly sizing will be a good match. In other words, overall, we like the Verano a great deal. Don’t get it twisted now, we still love to drive and we still adore the feel of an utterly responsive car. However, within that, we can recognize the need for a car like the Verano. The Buick pleasantly delivers the amenities of a large luxury car within the packaging of a compact sedan. Yes, its look would lead you expect something more performance orientated, but the fact of the matter is, that (choke, cough, cough, cough) simply isn’t on the mind of everybody looking to buy a reasonably priced car with a nice feature set. 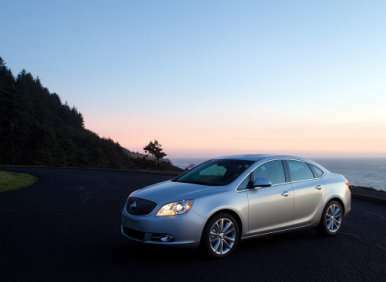 And, those are the people to whom the 2013 Buick Verano is designed to appeal.